Exotic foods are ideal for cutting calories as they don’t rely on adding flavour with butter, oil, cream and cheese. Many exotic foods use lots of fresh fish and vegetables and very little red meat, fried foods and dairy products, making them naturally suited to saving unnecessary calories instead of trying to make ‘low calorie’ versions of your favourite foods and just feeling like you’re denying yourself. With more and more supermarkets stocking a good range of world foods, it’s easier than ever before to buy exotic ingredients. You can try some of these ideas without having to spend a fortune on unusual ingredients from specialist shops. It’s really not as hard as it looks to make decent sushi. Of course, you’re not going to make it look as professional as a sushi chef that’s trained for 15 years just to cut the fish, but you’ll get a lot more for your money that buying those little packets from the supermarket. 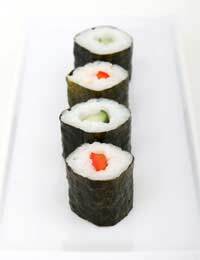 All you need to buy is sushi rice, rice wine vinegar, nori (seaweed) sheets, mirin (a sweet wine) and whatever you want to fill your sushi with (raw or smoked salmon is good, as is avocado or tuna mashed with mayonnaise and soy). Simply cook the rice as stated on the packet, stir in equal parts of mirin and vinegar and let it cool. Lay a sheet of nori on a chopping board and make a two inch layer of rice. Lay a horizontal line of your chosen filling and roll it up, wetting the edge to make it stick. Cut into discs with a very sharp knife and serve with soy and wasabi. The classic Vietnamese noodle dish is called Pho and it’s surprisingly easy to make, not to mention low calorie and totally delicious. All you need is plenty of beef bones (ask your butcher, they may give you some for free if you buy something), a piece of fillet steak, an onion, star anise, ginger, fish sauce, spring onions, noodles (flat rice noodles are best) and some chopped red chilli. Start by grilling the skin-on halved onion and ginger, then putting it in a large saucepan with the beef bones (add a bit of stewing beef if you have it) and covering it with water. After an hour or so of boiling, skim the stock and add fish sauce. Cook the noodles and add to a deep bowl per person. Pile in slices of filet steak, chilli and spring onion and then pour over the hot broth. Serve with chopped coriander. Peri Peri is the traditional Portuguese spice mix that’s perfect for meat, fish and vegetables. It’s a hottish mix of chilli and aromatic spices including orange peel, giving it a zesty taste. You can easily buy ready made ‘sprinkle on’ Peri Peri spice mixes in the supermarkets and it’s perfect for adding flavour without hardly any extra calories. Try dry frying a kilo of king prawns and sprinkling on some Peri Peri spice for the last 20 seconds. Serve with a squeeze of lime and mashed sweet potato for a simple meal that’s fancy enough for a dinner with friends.